I went offline for a while and this is why. 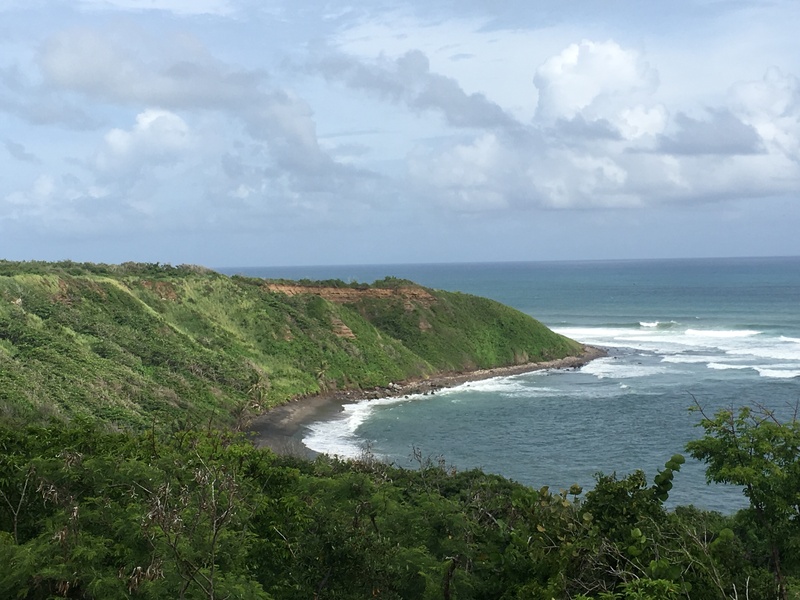 I spent a week visiting various Caribbean islands and not keeping up with world events – win/win situation. Most Caribbean Cruises leave from mainland United States, usually Florida, but Carnival Fascination is based out of San Juan, Puerto Rico. This cruise had the advantage that there was a port call every day and no “At Sea” days, although I guess you don’t have to get off the boat if you prefer the activities on ship. 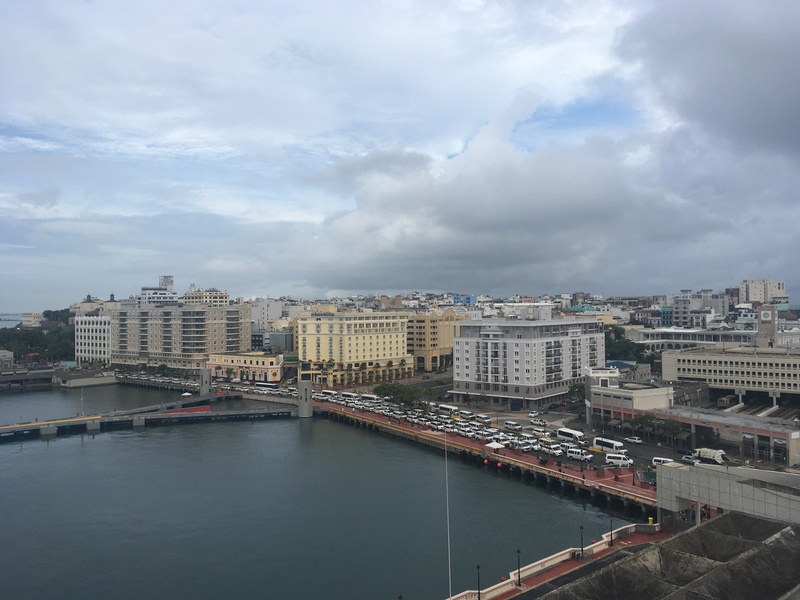 I spent a few days spent exploring Viejo San Juan and then boarded the ship for the next part of my adventure. Even though departure time wasn’t till 21:00, I boarded in the afternoon to get to know my home for the next seven days. I found the dining room, the library and the casino so that was my main interests covered. I got the ‘Your Time Dining’ option which meant that I could turn up for dinner when I wanted and I wasn’t assigned a table to eat with the same people each night. I like that I have the option to sit by myself (and chat to people at adjacent tables) or I can opt to share a table. This is really the best way for me to meet people when traveling. After dinner was the Mandatory Safety Briefing and then it was time to depart. I watched the lights of San Juan get smaller and smaller from Deck 14 next to the Mini Golf (because of course there is Mini Golf on the ship, as well as waterslides on Deck 11). Up early ready for a day on shore. I visited St. Thomas on my last cruise but I chose to go snorkeling with sea turtles (which was awesome) so I didn’t actually see any of the island. This time, however, I was all ready to explore Charlotte Amalie. I knew that Charlotte Amalie is known as a shopping destination, I didn’t realize that was it. A great place to visit if you want jewelry or Swiss watches otherwise not so much. 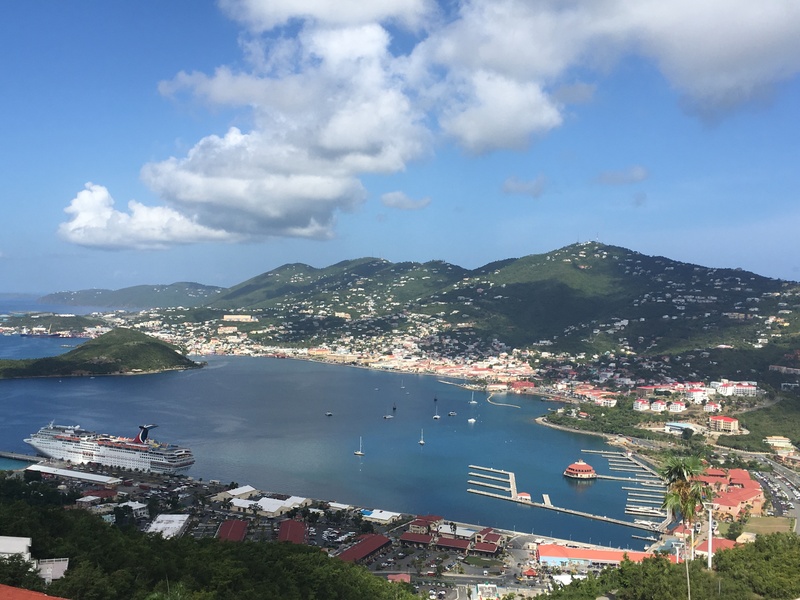 Lesson learned – next time I’m in St. Thomas, I’ll book an excursion to Magen’s Bay. I expected – colorful, loud and chaotic (although I did get off the ship while everyone was gathering for excursions). 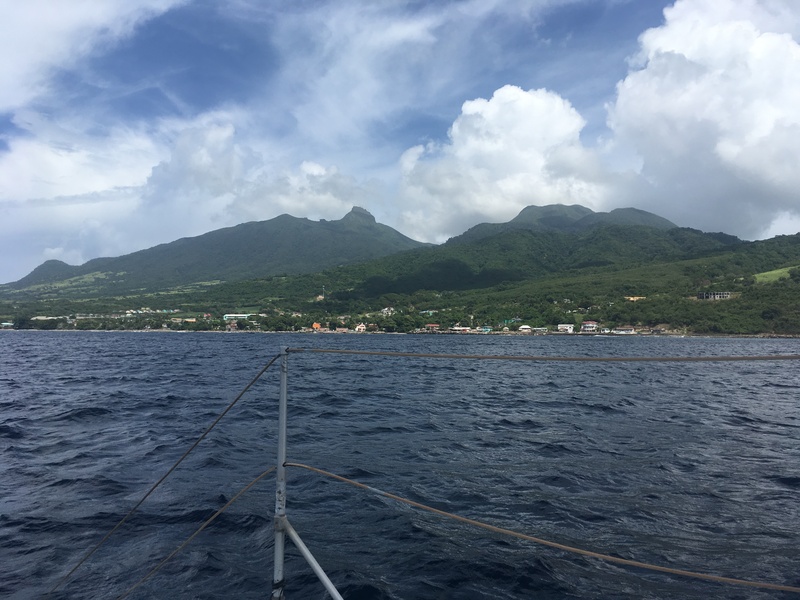 As the boat was moored directly in Roseau, I headed off on foot to explore. I was aiming for the Botanical Gardens which I strolled right past because the entrance wasn’t marked but a helpful local pointed me back in the right direction. 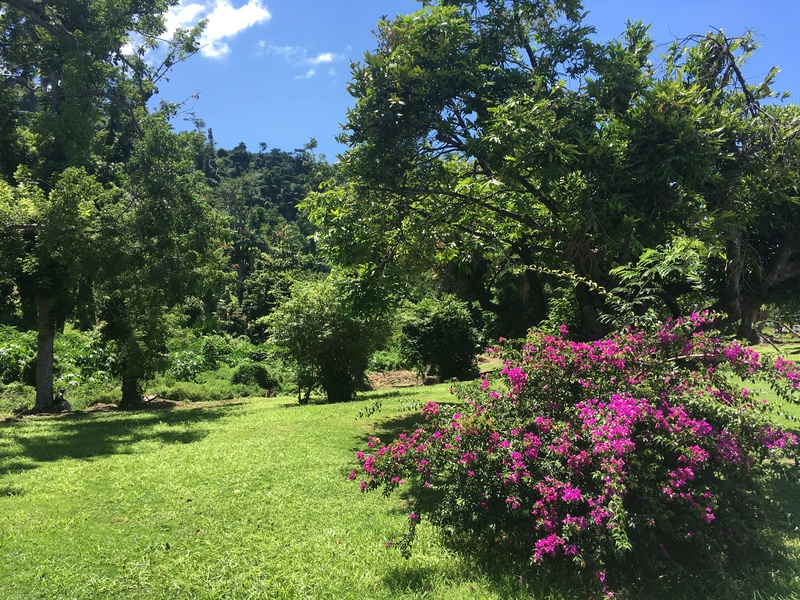 The gardens weren’t as manicured as some but there were some beautiful trees and the edges of Dominica’s rainforest. 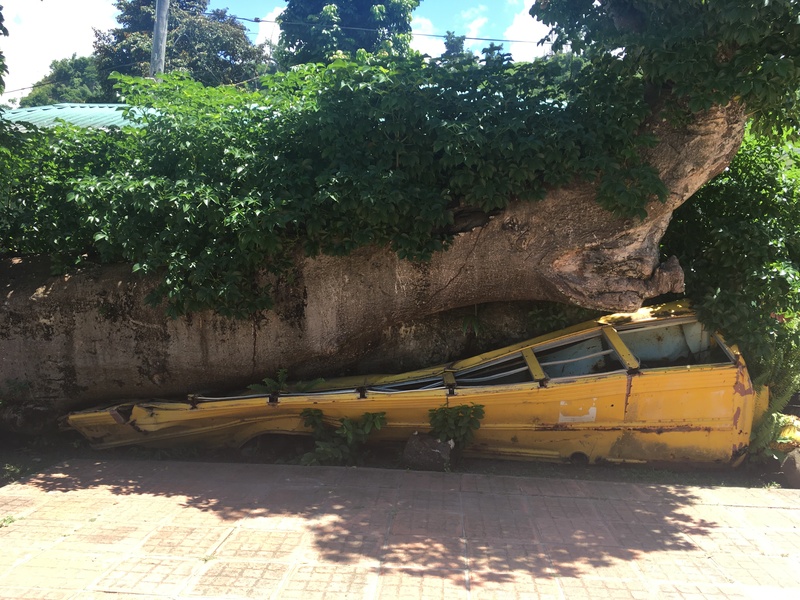 The most spectacular thing was the baobab tree that had been blown down in Hurricane David in 1979 and landed on a, thankfully empty, school bus. I read the sign giving the story and only noticed afterwards that the bus is still there! 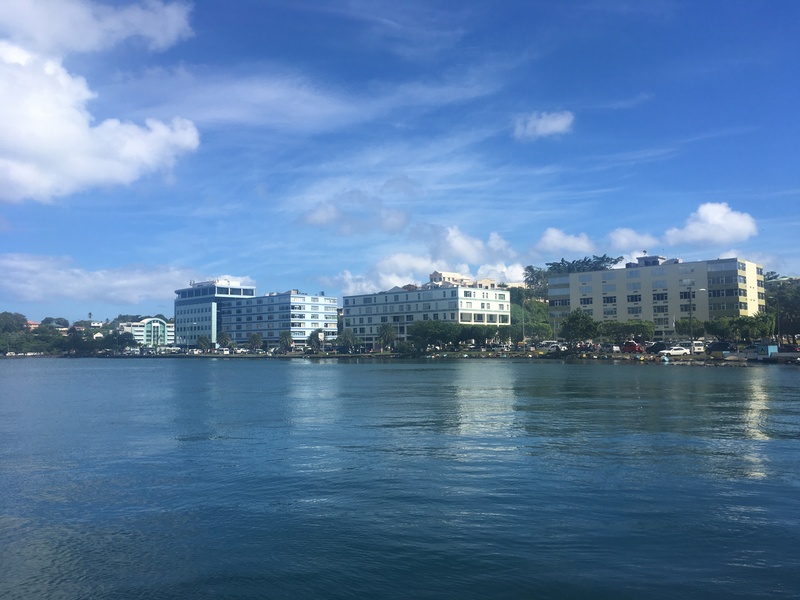 Right by the cruise ship dock is the old post office which is now Tourist Information downstairs and the Dominica Museum upstairs. If you walk through the Tourist Information you end up in a colorful market but I paid my $3 dollars and headed to the museum to learn more about the island. There was a good display on volcanic activity in the Caribbean in general and Dominica specifically, and obviously a lot of information on how the islanders used to live and colonization. 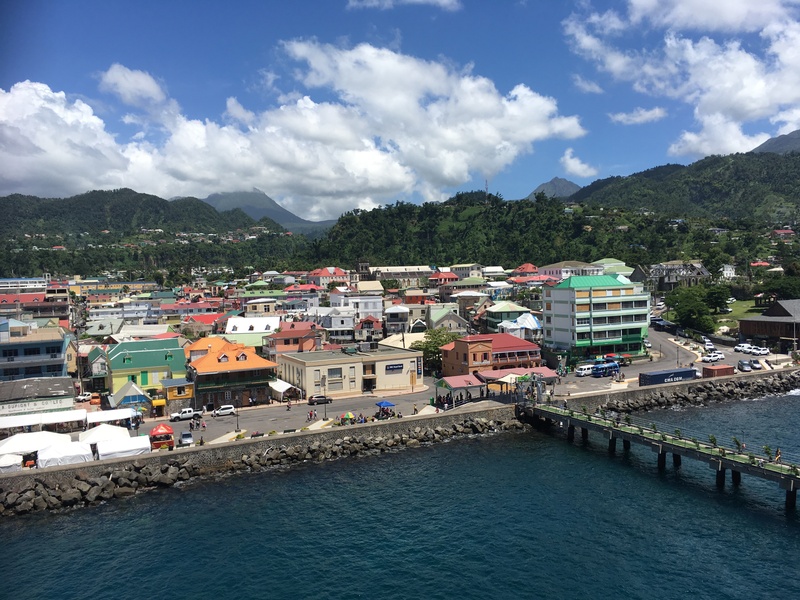 Dominica is one of only a couple of islands where the Carib Indians still live – it is too mountainous for the French and then the Brits to occupy totally. 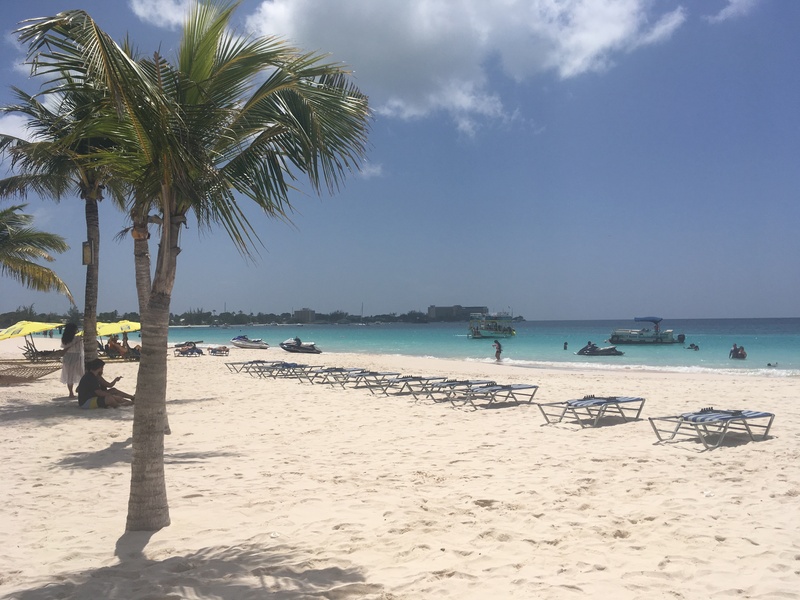 Unlike the last time I took a Caribbean cruise, this one did not involve any beach time (I think Carnival are the only cruise line that don’t own a private island) so I decided to spend time at the beach in Barbados. Cruise ships dock just outside Bridgetown and, like all ports of call, there are taxis waiting eager to take you places. There are lots of beaches that can be reached easily and I opted for Pirate’s Cove on Carlisle Bay. Then I spent the day on a lounger and in the water and back on the lounger and back in the water and so pretty much all I can tell you about Barbados is that it has soft white sand and warm turquoise water and I want to go back. 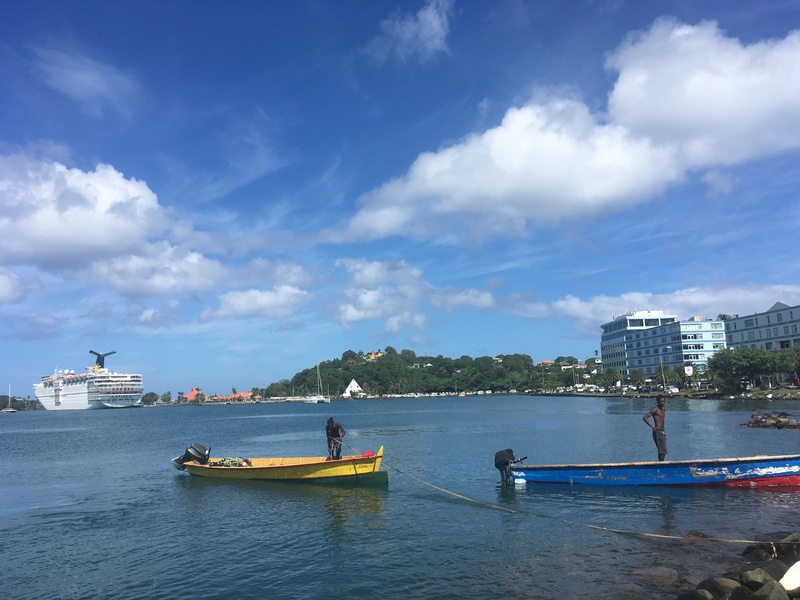 So after my disappointment, I just took the opportunity to visit Castries which is a nice town. It was warm wandering round in the sun so I headed back to ship for lunch and to cool down. Another time, I will make an effort to see more of the island but this time I found a nice spot on deck and read my book and that was good too. (Especially when it started raining.) But if anyone fancies a vacation in St. Lucia, drop me a line and we’ll plan something. 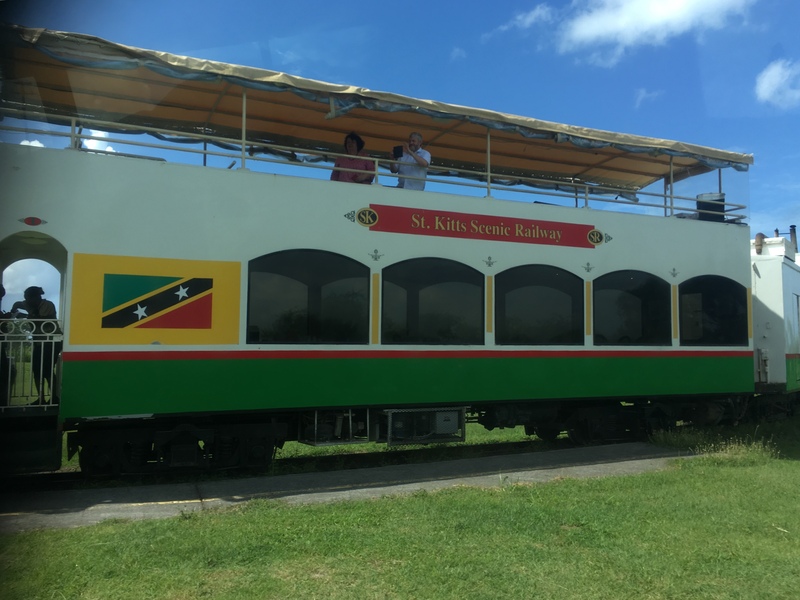 This was my big excursion day because St. Kitts has something no other Caribbean island has – a train! It was used for the sugar trade but now it’s just for tourists and, as I love trains as much as I love boats, it was definitely what I wanted to do with my day. The train itself was a double decker. Downstairs was rattan furniture and air-conditioned, upstairs was open-air and the best way to view the scenery. After departure from Needsmust station, the train meandered round the island covering about 18 miles in two hours. The route passed through many villages and former estates showing what remained of the sugar industry that shut down in 2005. It was a great way to get a feel for the island and its history. After the train ride we transferred to a catamaran to circumnavigate the rest of the island. I’m always happiest on a boat and this was no exception, spotting a pod of dolphins was just the icing on the cake. 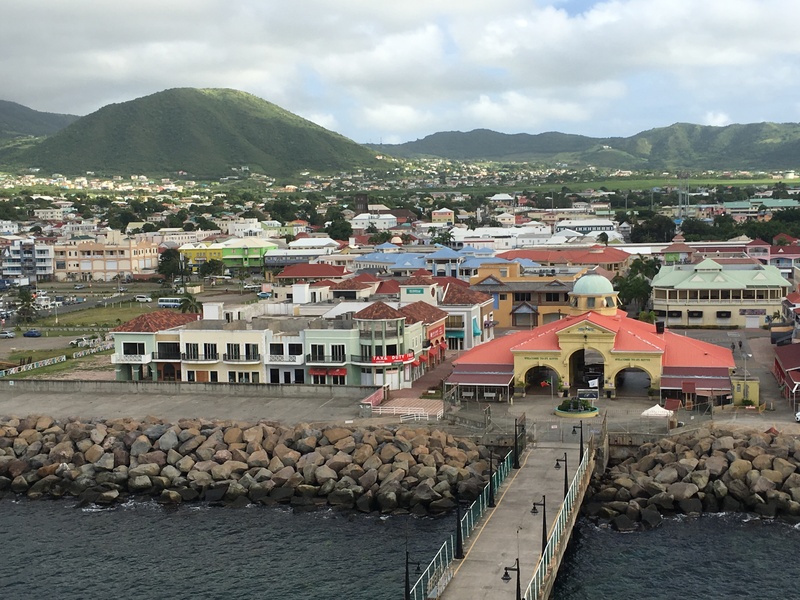 Basseterre itself was probably my favorite of the capitals we visited. It may have helped that I was there on a Friday which is when everyone comes to town but there was a great atmosphere and some nice architecture. I think I may come back to St. Kitts, if only to see Nevis. I deliberately chose a tour that would take me to both parts of this divided island, part French, part Dutch but with no division for the people who live there. I also picked the right day to be mostly stuck on a bus because this was the only day of the trip when it rained frequently. 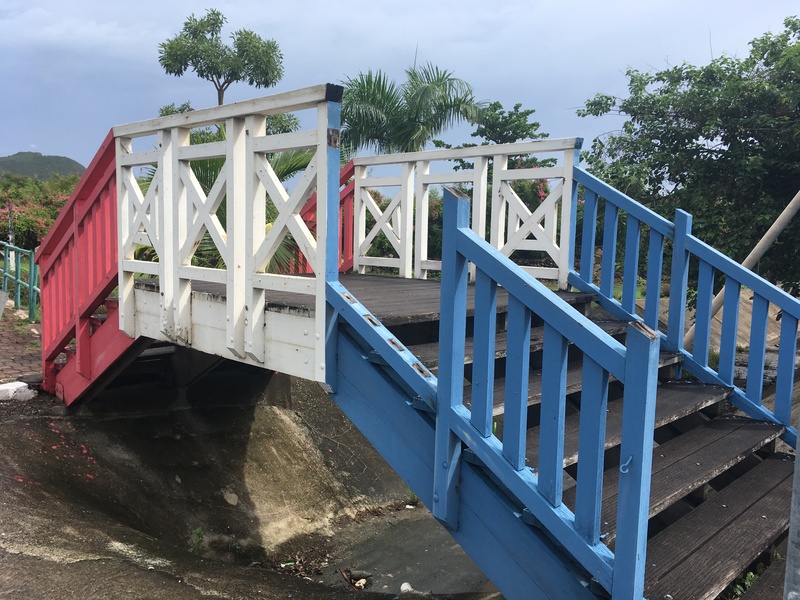 The tour was billed as showing the top ten sights of the island but a lot of it was actually seeing the impact of Hurricane Irma, the areas that are still damaged and those that have been repaired. The main tourist season starts in November and huge efforts were being made to get things finished by then but regardless it was heart wrenching to hear the guide explaining what areas used to be like and wondering whether the island will fully recover before the next hurricane. The airport terminal building is still closed but visitors can still fly in thanks to the opening of an arrivals tent and a departures tent at the airport. 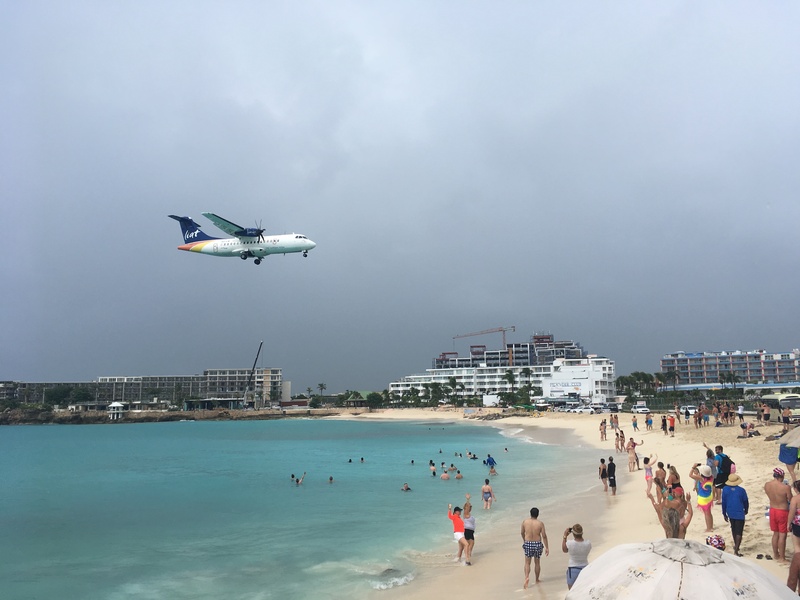 The highlight of the trip for me was Maho beach, right by the airport despite the fact I was there in torrential rain. The attraction of this beach beyond the obvious white sand and turquoise sea is plane watching. It is breathtaking to watch the planes coming into land just above the beach. And, as far as adrenaline sports go, being stood on the beach behind a a jet engine firing up to take off is not something I will forget easily, especially with the amount of water it shifted after the rain. Even though Phillipsburg was an easy walk from the ship, after getting a look round from the shelter of the bus, I was happy to head back aboard to dry off and enjoy my last few hours on ship. By 07:00, we were back in Puerto Rico. So after one last breakfast (avocado toast), I said my final farewells to the ship and headed ashore. I did not want to leave and briefly considered following the cruise director’s advice and hiding under the bed in my cabin to stay for another week. I once read a comment made by someone that they didn’t like to travel because they put down roots in a hotel room. I would flip that and say that is why it’s easy for me to travel, I very quickly feel at home anywhere and so a week on a ship is more than enough time for me to feel completely settled and able to stay forever. Almost everyone I spoke to on the cruise thought I was so brave for traveling on my own but I just don’t see that. Solo travel is easier, there is no negotiating, no compromise and no responsibility. When I travel with other people, I worry about whether they’re enjoying themselves, when it’s just me I only do the things I enjoy. 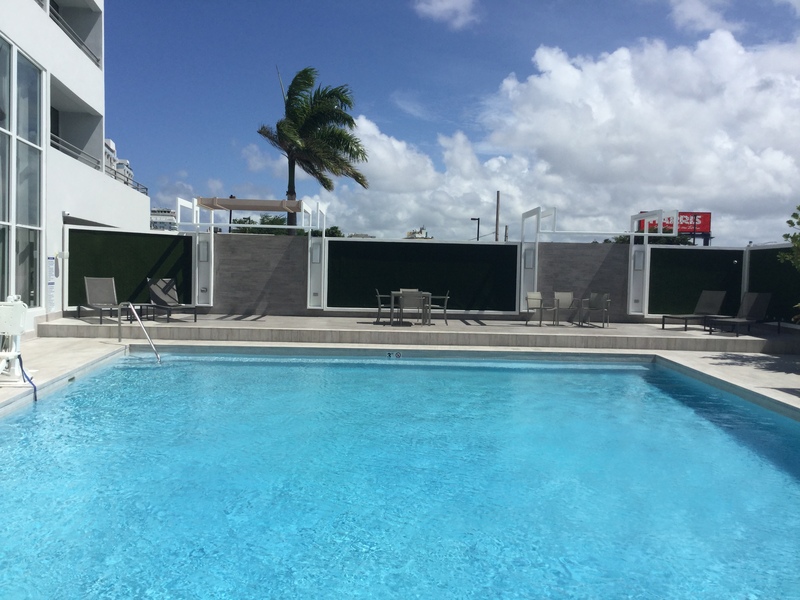 In order to end the trip right, the best decision I made was to change my accommodation booking in San Juan – I decided to stay somewhere with a pool and have a nice relaxing time before heading to Europe and the autumnal weather.